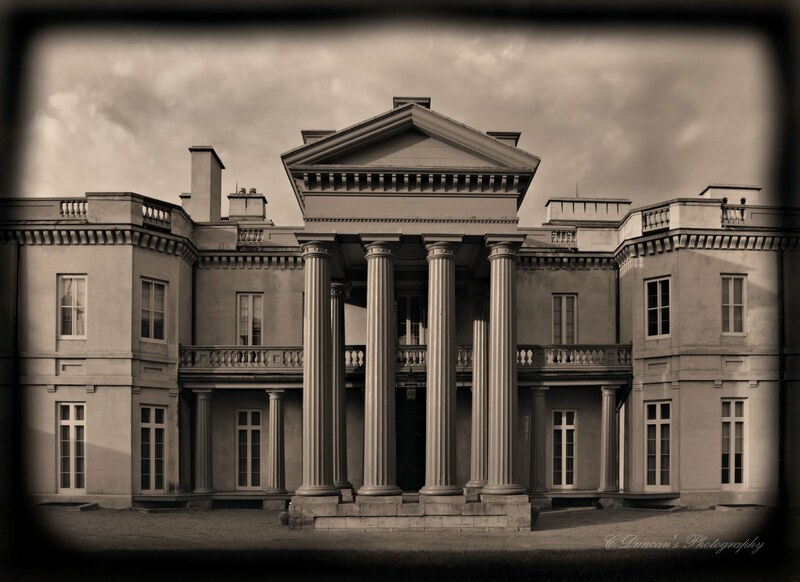 So, as promised, here is part 2 of my wanderings around the Dundurn Castle estate. Looking at the photo essay I've gotten out of this series of images, I've decided I still lean towards interesting elements of design, historic details, and architectural discoveries when I look through the lens... all well and good because they showcase the care and craftsmanship that went into such a fabulous property. But as usual, I've not gotten a single image with any action, people, tourists, gardeners, and what have you. So that shall be my next project for this location, when I next visit with my camera! 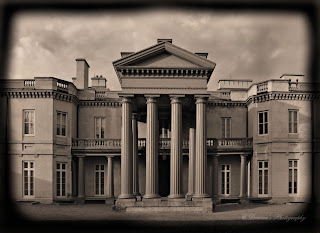 For the image above, since you really feel the passing of time when photographing this national historic site, I've used a "daguerreotype" filter in this images final edit. Much richer than a simple B&W conversion, I love to use this effect on older architecture. This next image above is another angle of the Castle Tower's rooftop, which is lined on all four sides with these quirky dove cotes. 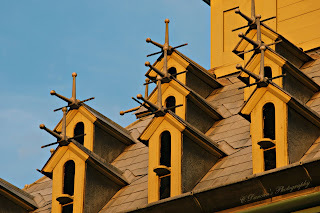 The intensity of the setting sun light really lit up the repetitious shapes nicely, showcasing them well. This last image was a surprise (and could have been a nasty one had I not seen it in time). 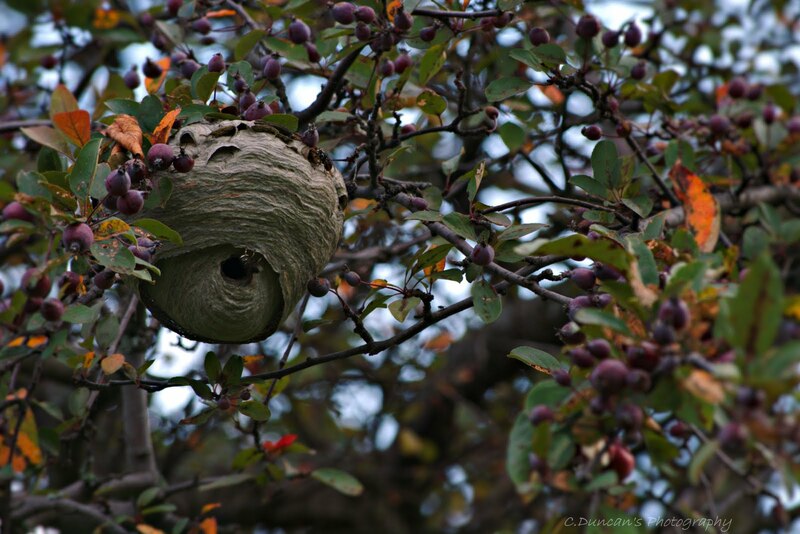 These miniature crab apple trees are scattered along the back of the property, and I narrowly missed walking right underneath this busy hive trying to get a shot of some of the stonework at the back of the castle. I shot this from about 6 feet away, using my telezoom to compress all the branches surrounding the hive into the shot, and obviously to get as close as comfortably possible. My family bravely stood another few feet behind me, confident that if I disturbed the inhabitants within, that it'd be "first come, first served". In the end, I really liked how the fruit and colors of the various leaves mingles with the day's last light. There's even a bee or two flitting in and out. To see each low res. image slightly enlarged simply click on the image. And as always, respect the rights of the photographer. Next week, I have some images to post via a new toy I bought for my Nikon! So stay tuned, and as always, thanks for letting me ramble on! Have a good one! I'm a happily married photo nut with two amazing kids, and a wacky dog. I love all aspects of photography, but especially nature, architecture, and landscape whether in B&W or color. Feel free to check out my profile for a link to my flickr page or profile at 500px! God bless, thanks for visiting today!